Brief Synopsis – During World War II, the strategic island of Malta is defended by the British while the Italians and Germans try to take control of it. My Take on it – This is a film that I was quite interested in seeing largely due to the fact that both Alec Guinness and Jack Hawkins star in it and I was curious to see how they would portray soldiers in a different kind of World War II setting than they appear as in The Bridge on the River Kwai (1957). 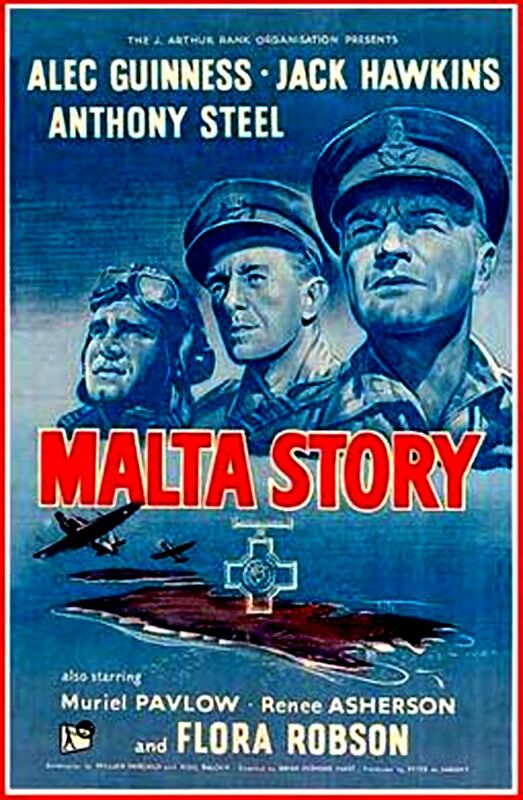 This film has a fascinating premise and shows the way that the people of Malta and the British soldiers stationed there dealt with the siege by both German and Italian forces due to the strategic importance of the island. Unfortunately, parts of this film feel a bit too stereotypical and unoriginal. The cats is great but they also feel a bit underused instead of allowing the characters to feel much more realistic and genuine. The love story that is set among the fighting isn’t strong enough since it feels very unrealistic. It too often feels as if Guinness and his co-start Muriel Pavlow aren’t really in love and that takes away from the realistic connection that they are suppose to have. They do a wonderful job with the battle scenes and we get a very clear picture of the various dangers that these en and women needed to face during the bloody part of the war. The dialogue of the film is also written really well because it allows us to get a much better understanding the strategic importance of this small island and why it was so crucial for the British to make sure that the Axis nations couldn’t take it over no matter the cost. Bottom Line – Interesting story about the siege of Malta, but some parts of it seem a bit too stereotypical. Great cast is slightly underused and that’s quite unfortunate. The love story doesn’t feel realistic enough even though since it feels as if Guinness and Pavlow don’t have a strong enough believable connection. The battle scenes are shot well and we get a clear picture of the dangers involved. The dialogue is done well too because it allows us to understand the strategic importance of these battles and why it was so crucial for this island to be defended at all costs.